"Lindy and Ulf visited our centre to tell some of their environmental stories for the children in our centre. They combined songs, puppets, costumes and acting to tell both traditional and their own original stories about the environment. Their caring and calm nature and passion for story telling shone through their whole performance, captivating the children’s attention for the entire show. This was a show that actually calmed the children rather than excited which was just what we were looking for. We organised Lindy and Ulf to tell environmental stories to help celebrate our new playground and build on all the work we have been doing with the children about the natural environment and sustainability. Lindy and Ulf’s beautiful stories added a richness and creativity to this work and we could see the children really took on board the concepts of care, love and respect for the environment through these stories.We will definitely be getting them back next year." "What a joy it was to have a vibrant, well organised delivery of story telling. 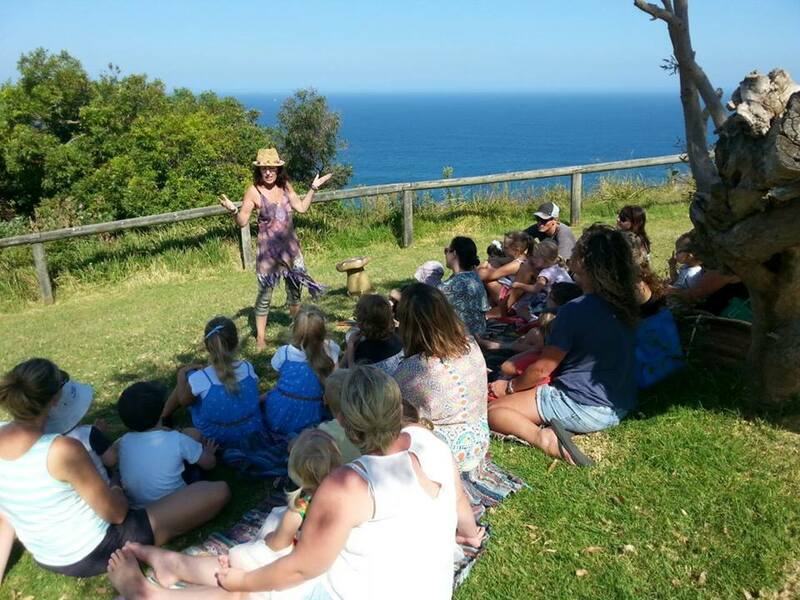 Lindy is animated and passionate both in her craft and her philosophy of protecting the environment with the children and Educators becoming instantly absorbed and captivated. A great mix of interactive moments through songs and sound improvisation along with times for simply being the observer and listener, being taken on each story's journey. Making a number of references to local spaces in our geographical region, Lindy was able to help connect the sense of belonging to place and children's associations with their community. We especially loved how Lindy greeted our children with a soothing Indigenous song related to nature, written by a local Aboriginal Elder"
A great mix of interactive moments through songs and sound improvisation along with times for simply being the observer and listener, being taken on each story's journey. ​We would thoroughly recommend Lindy to other bookstores, schools or libraries - professional, prompt and a wonderful storyteller! Mandy Book Bazaar Umina. Lindy and Ulf proved to be amazing storytellers at events organised for children during the school holidays in Blacktown. The children were engaged with the stories and it was evident how much they loved it through their reactions and expressions on their faces. Entertaining and educational at the same time. I would definitely recommend Heart to Heart Storytelling to anyone looking for entertaining and proficient storytellers. ​We loved having you at Jared's birthday party on Sunday, the children connected with you so quickly and were completely engaged in the stories you told. The personalised story for Jared was great! His look of realisation was priceless. Kitty and Anthony. ​Thank you so much for your thoughtful, researched, considerate, spellbinding story at Beatrix's 5th birthday party today. You captivated more than 30 kids aged 1-8 on a 40 degree day. You are utterly unbelievable! Even my husband was raving about your prowess! Laura. We had an excellent assembly yesterday and highly recommend Lindy as a role model. As a storyteller she was engaging, suspenseful and very dramatic which was amazing to see. Her level of understanding about the approach to take with our students who ranged from Kindergarten to Year 4 meant that the audience was engaged throughout her 20 minute presentation. She had the right balance between drama, student involvement, repetition in the story and humour to have the students laughing, silent and actively responding for the entire story. We were so impressed we will definitely invite her back in her capacity as a storyteller to workshop with our students so thank you for organising her to visit us! Just fabulous- kids loved it. What a gift you are giving to us all, it brings so much more colour & depth to our day. Thank you. People love your stories, don't ever stop! That fisherman's wife she just wanted too much! That was better than TV! Are you really a fairy? Was that story really real?